Would you be surprised if I told you that many of the projects I embroider never get framed or finished? 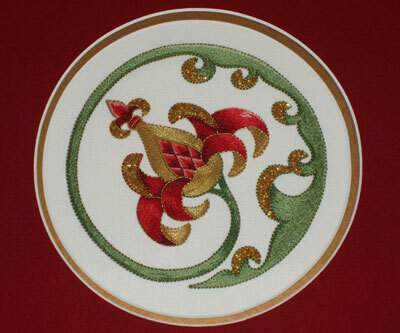 But the Goldwork Pomegranate was different! When I finished stitching it, I was itching to see it framed! The style of framing has been seen before here on Needle ‘n Thread! A year and a half ago, I stitched this Golden Pomegranate project designed by Margaret Cobleigh for Inspirations Magazine and I loved the way the framing turned out. So when I was ready to frame my goldwork pomegranate, I wanted the same look. On the previous framing job for the Golden Pomegranate, I had the piece triple matted, with a green next to the design, then gold, then red. For my current stylized pomegranate, I opted for a double mat, with spacers between the two mats. I always (always!) put glass over my needlework, despite what I’ve always been told by my dear old aunt about the necessity of framing needlework without glass. I don’t understand not using glass, as long as the glass isn’t crushing the stitches. 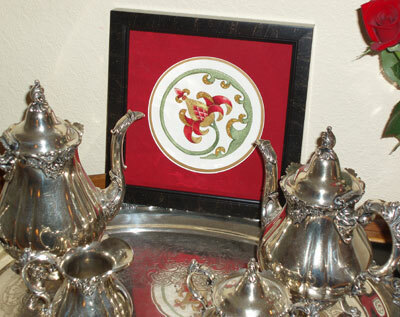 The gold mat on the piece is a plain mat, but the red mat, as you can see in the photo above, has a texture to it – it’s one of those “linen finish” mats. I love the color of red! There are lots of glass choices available today, by the way. I generally choose museum quality glass. It cuts down on UV rays, and doesn’t really reflect glaring lights. It’s nice, it doesn’t cost very much more than plain glass, and it’s worth it on finer pieces of needlework. So this one has museum glass on it, and the frame itself is black shot with tiny hairline streaks of gold. 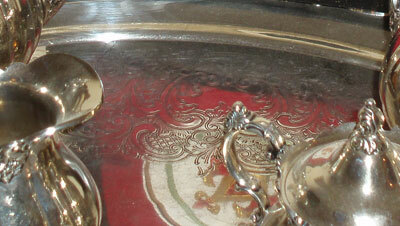 I’m not quite sure what I’m going to do with this piece, so right now, it’s sitting on the silver service…. … only because I like the reflection. Why is it that I can never bring myself to keep my own embroidery? Do you have that problem? Can you please help me overcome it?!? 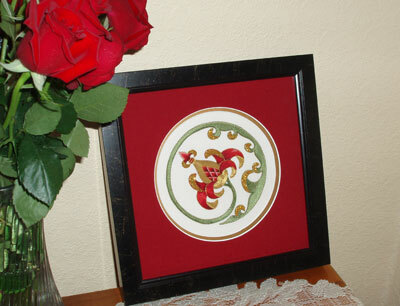 That’s the framed Goldwork Pomegranate, then! If you’re interested, you can follow the progress of the Goldwork Pomegranate project to see how this type of needlework is done. I don’t see it as a problem that you want to give away your embroidery. It means you don’t have to find space in the house for it, and someone else gets to enjoy your work! It looks lovely! I too love red, and think that your red mat sets it off beautifully. I must say that I was surprised by the angle of the pomegranate, all framed up. I assume it was always on that angle, but I just didn’t notice! I try not to get many of my works framed. This is partly because most of the things I design, are for my books or classes. There is a feeling out there that framing is expensive (it is), and if students/readers feel that a project has to be framed, I think that sometimes they are much less likely to do the project/class. Of course, just because I frame something doesn’t mean that others have to, but I accept that some people find it difficult to think outside the box. Also, our walls are full, as I worked as a picture framer when I was at uni. Can you guess who they got to stretch most of the needlework that came in for framing?! This is lovely! I think both this one and the Golden Pomegranate should hang together. So it you decide to give it away, it should be both of them so they can hang together. I agree – this and Golden Pomegranate should be together, or at least near each other. I like that the framing coordinates and is not matched exactly. I get pitifully little finished, so what to do with the item isn’t usually an issue. On the last 2 pieces I did finish, I had them professionally framed. They were odd sized pieces, and needed the frames made. As far as glass vs. no glass, I had always read that you should consider what the environment it would hang in is like. A non-dusty/greasy, non-smoking home didn’t need glass, otherwise use glass. I’m glad to hear that museum glass is not much more expensive now. Last I checked the difference was huge. With the glass issue, I’ve found that no place is dust-free and sunlight takes its toll on needlework, even when it isn’t hanging directly in the sun. 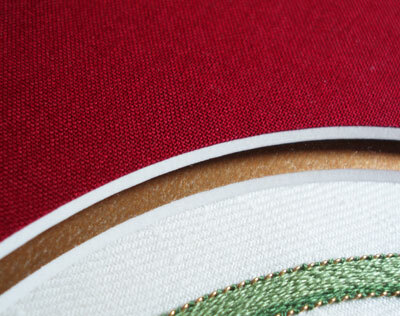 I like to cover my bases, especially with goldwork embroidery. Anything that can reduce the tarnishing time is good in my books! So glass it is. I was surprised, actually, that the difference in museum vs. regular glass wasn’t that great on this piece – it was about $6 difference. Framing is expensive, but I look (and wait) for custom framing sales. Larger hobby / craft stores with framing departments often run sales, and some of these places have excellent frame shops. But I’d definitely check them out before using them. If you’re going to pay for framing, make sure the shop knows its craft! Smaller custom frame shops also are very good about matching prices or running discounts on supplies, so it doesn’t hurt to talk to them a bit about prices before agreeing to a set price. I’ve got mat-cutting equipment that I use for mat board and square windows for things I do at home, but whenever I want anything round or particularly finicky cut, the professionals do a much better job! The framed piece is fabulous and I don’t know how you can bear to part with it but then I have very few pieces of my finished work and I tend to make stuff and give them away… So I can empathize with you. Mary, I think it is a basic given that most people who embroider give their finished projects to family and friends, at 74, I doubt I will ever change, grin. I do have most of the things I gave my parents down thru the years as they are now gone, and it was understood that I would get the hand embroidery things back, so they are now hanging in my home. Love your newsletter today. Framing is a challenge. I too have given away all of my embroidery projects over the years. I find myself starting projects with a gift in mind. I am working on a table cloth now that’s a stitching exercise to make me happy. I may have to keep that one. It came out beautifully. You should be proud. The framing job compliments it perfectly. It should be admired. Where you have it sitting right now seems appropriate. I’m sure after you have it to look at you will decide on another place you will want it for awhile…then move it again. I seem to do that alot. Don’t forget you also have a sister whose birthday is in October and who also loves this piece. In fact you are coming to visit that very same sister very shortly and wouldn’t that just be a lovely early early early birthday gift to bring along? I think so. It turned out so beautiful with the matting and the nice black frame. Just beautiful! I am like you : I never really keep things home. For a simple reason : I am more interested in doing things (= embroidering) rather than looking at completed work. A superb finish for a wonderful piece. Hey Mary! Why not use this Golden Pomegranate as your next Giveaway? (I just ducked my head to avoid whatever it was you just threw at me!!). Well, it would solve the keep it/who to give it to problem. And I might even win. ‘Joke’. My husband has a habit of telling jokes without us realising they are jokes. So, we’ve got this thing now of holding up our hands as if holding a sign. The imaginary sign says ‘JOKE’! That brings a laugh anyway. I’m still out west and the grand daughter is sick so I still haven’t had a chance to really have a good wander through the new site. And 4 of us are vying for the one laptop. I love how the matting echos and sets off the design on this one, you’re right, it had to be framed. Not much of my work gets framed, either, mainly becuase most of what I do is on items of use — trim on clothing, napkins, book covers… A lot gets given away, too. That bugs my husband sometimes. My next project will definately stay with me, though. I love the new look.. the new colours… of the site.. it’s amazing, to say the least!! Previous Previous post: The Blackwork Fish Is Coming Along Swimmingly!